Mokosh is a Russian brand of high quality jacquard wraps and Amata, who runs the business, draws on a lot of natural and folk references for the interesting and often intricate designs. Mokosh is a Russian brand of high quality jacquard wraps and Amata, who runs the business, draws on a lot of natural and folk references for the interesting and often intricate designs. 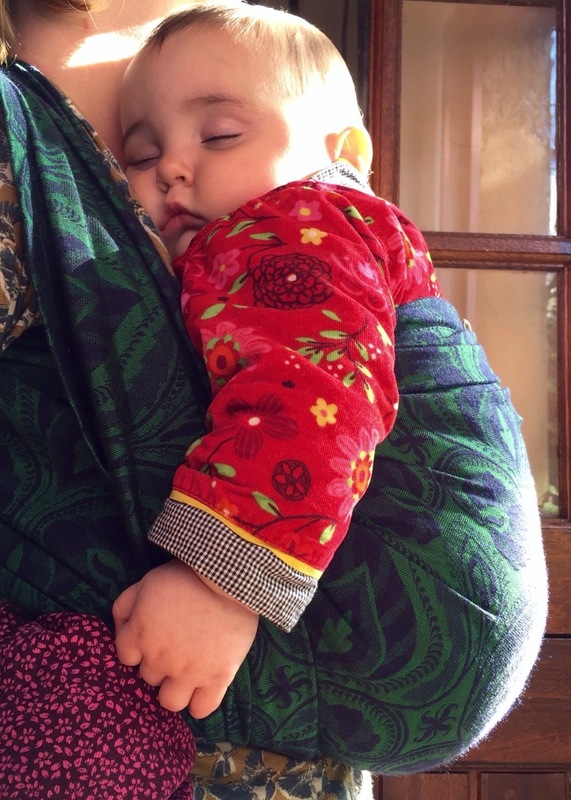 This review has been a long time coming as it was actually my first “high end” woven wrap and arrived when Smallest was a few weeks old. It’s the wrap that totally sold me on Mokosh as a woven wrap company and I’ve had great fun wrapping since. The first carry out when Smallest was, errrr, small. Fire is one of Mokosh’s oldest designs and I understand it has been discontinued which, if this is the case, is a crying shame as it’s wonderful. The pattern is a repeating design of flames that draw directly on Russian architecture and tradition. 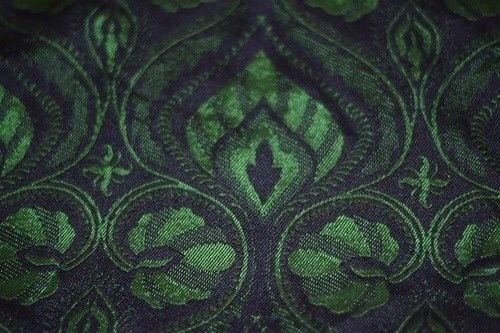 Malachite is made from 45% cotton with 25% malachite green silk and 30% navy cashmere. It weighs approximately 220g/m2 so is pretty thin and light but tightly woven. The heaviest wraps I have are the thistles at 267g/m2 which is the highest I personally like. Being short and petite it’s easy to feel overwhelmed by heavier wraps so Malachite is perfect. The luxury of 55% of silk/cashmere absolutely shimmers through in this wrap with the cashmere lending feather softness. 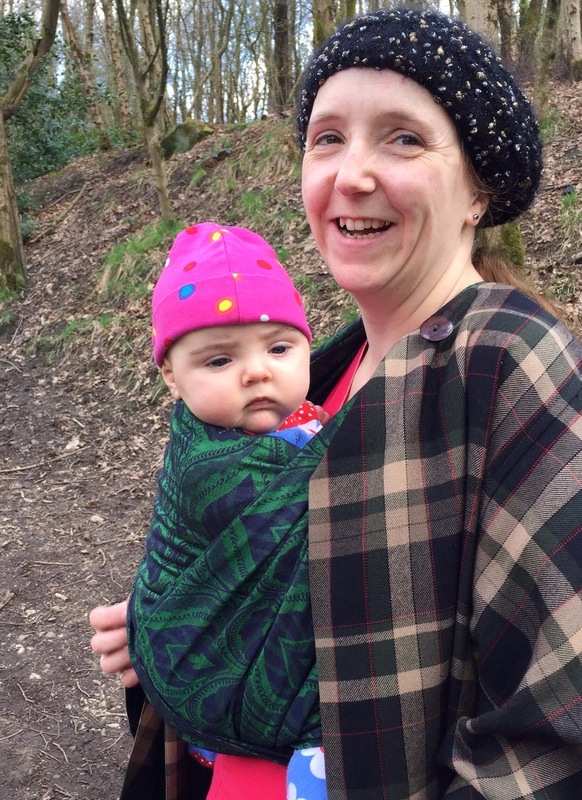 Released Autumn/Winter 2014, it is the perfect snuggly wrap for cold days but still retains excellent breathability. The colours are strong and moody so right up my street. Like most Mokosh it’s a wrap that looks perfect on the right or wrong side so you can choose to accentuate the green or navy depending on how you feel. If there was ever a wrap that just wraps itself then it’s this one; it’s heaven to work with. Passes glide easily and tightening is hassle free; this wrap needed virtually no breaking in. What it lacks in rock solid grippy texture is made up in just the right amount of diagonal stretch to enable secure carries that drape and wrap beautifully. As mine is a size 6 it’s really suited to multi pass carries and I tend to reach for it if Smallest needs a cuddle and we are off out. I currently favour a Robin’s hip carry or a good old front wrap cross carry; arms out if she’s wanting to interact with others or in with the cross passes over if she wants to block the world out. Malachite knots really, really small and neatly which I love. Some wrap jobs need a little extra tightening but even with my half arsed attempts on some days, Smallest stays pretty much in place. Malachite is allllll about the wearing. Honestly, if I want to feel a little bit chic then I reach for this wrap. On the most sleep deprived days it has cheered me up no end to be carrying in such a dreamily soft and, quite frankly, glamorous wrap. The tails are, well, stunning; they swish, shimmer and fall so beautifully. It’s not just about the high end feel of it, or the design which is my favourite. Malachite sums up for me everything about what I want in a wrap. It is fun to work with, partly because it’s a 6 so I can play with all sorts of finishes. Someone said it was really just suited to squishy newborns but I disagree. Malachite holds up really well in multi pass carries; it never feels diggy on my shoulders and it’s so easy to spread passes out for good support. Silk is a strong fibre and I’d have no hesitation using this for a long time as Smallest grows. Most of all, it’s the wrap that Smallest has most often fallen asleep in and there are some things that can’t be topped. Few were made of these wraps but if you can get hold of one, do. Mine is Smallest’s legacy wrap so it isn’t going anywhere. Smallest asleep, aged 9 months.